We all know the fable of the Phoenix – the mythical bird that dies engulfed by flames only to be born again in all its splendour. Let me tell you then about a quasi-mythical place in Venice, Italy that has died a painful death by fire three times only to rise from its ashes back to its former glory every single time. 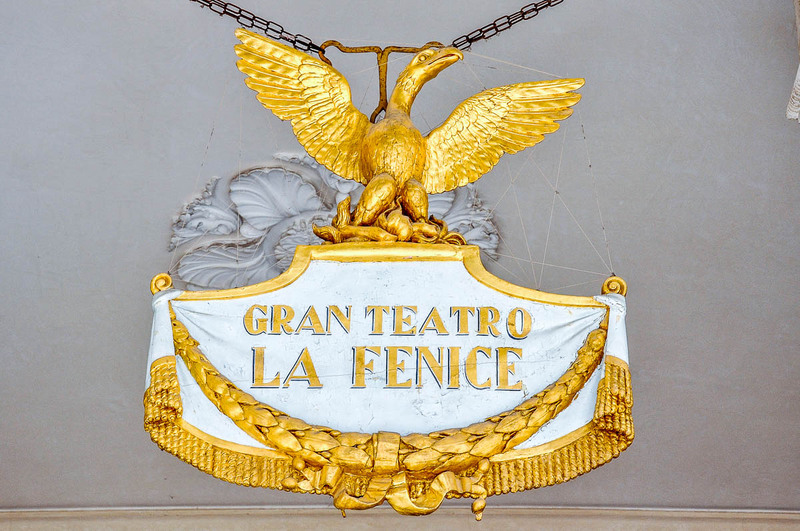 Gran Teatro La Fenice stands on a small square in the labyrinth of the Venetian streets. Its white façade juts up towards the sky to which so often it has gone up in flames. 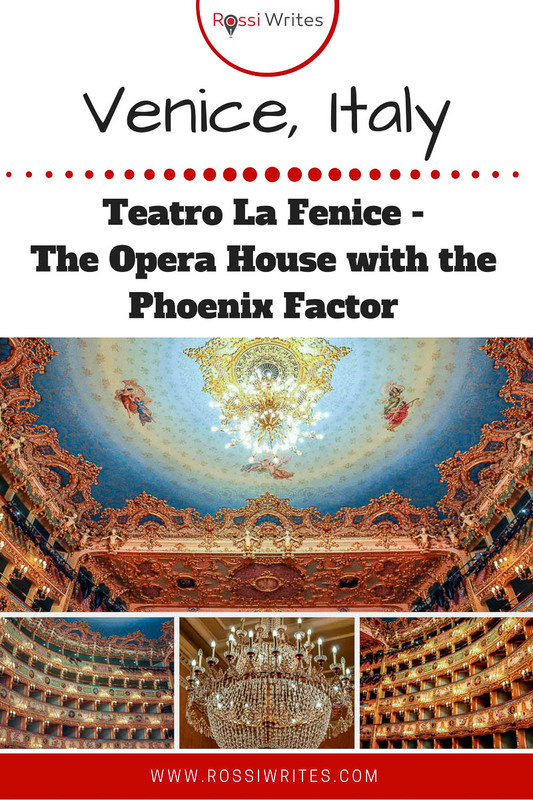 Named after the Phoenix (in Italian – La Fenice), this world-famous theatre and opera house is the perfect architectural embodiment of the magnificent appearance and the dramatic fate of the mythical bird. 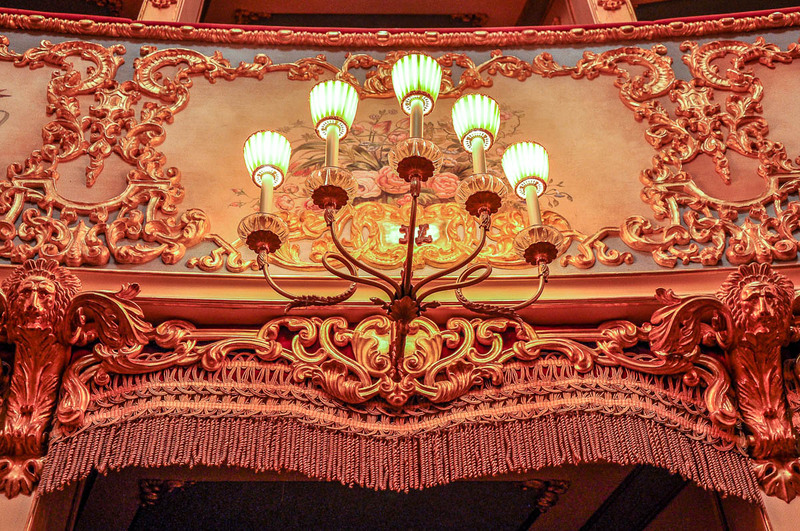 Stepping into its opulent theatre hall is akin to finding yourself in an enchanted forest. 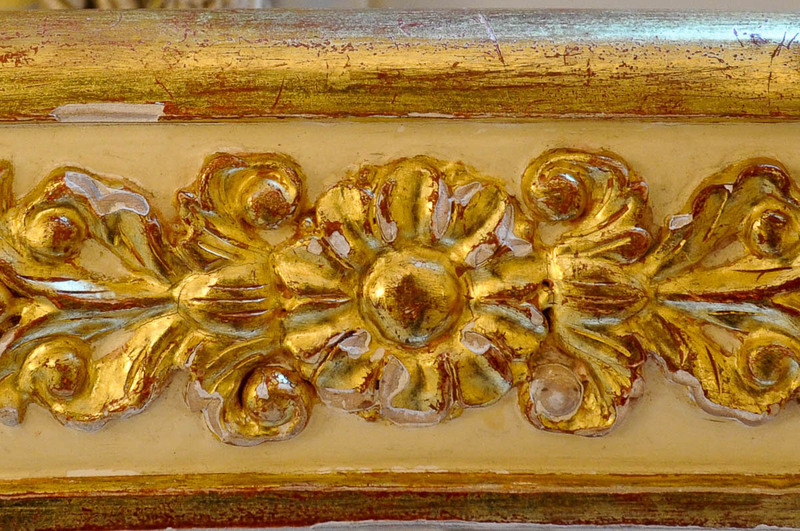 Rich gilt ornamentation covers every available surface. Bunches of lights flicker around you. Rows upon rows of boxes follow the curve of the walls. 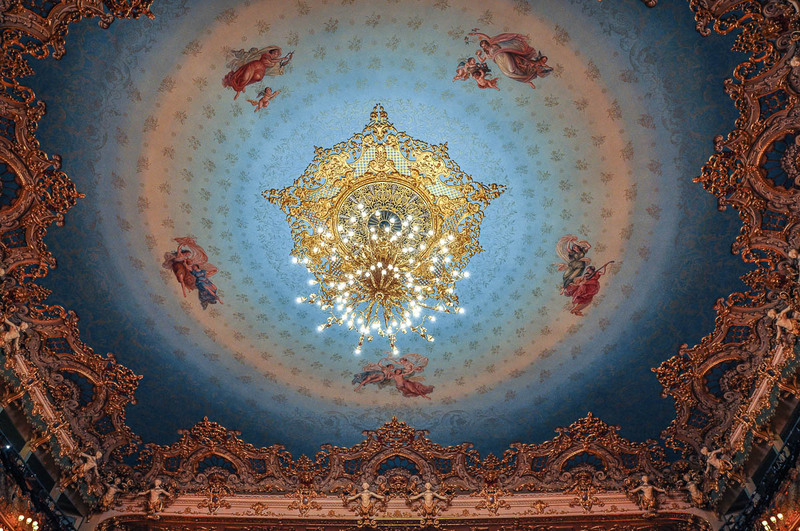 The ceiling is celestial blue and it is adorned with lace-like decorations. 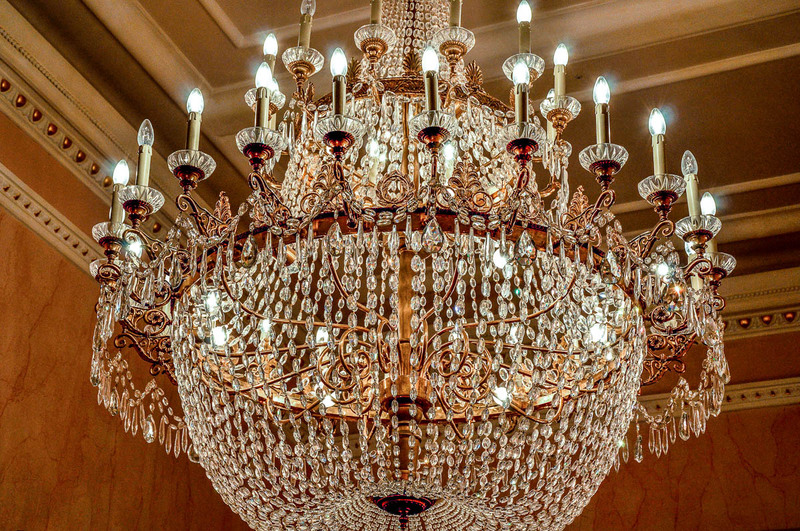 Right in the middle of it hangs a whimsical crystal chandelier. 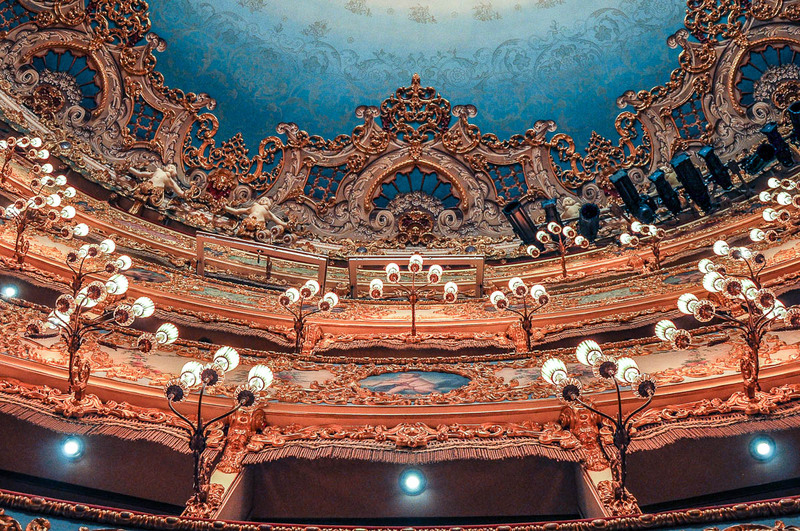 You may have come here to see a performance, but the theatre itself steals the show. 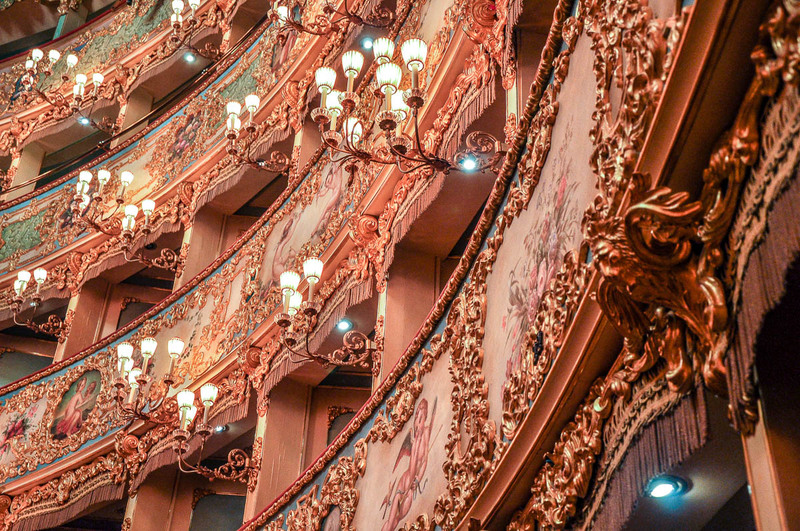 I decided to tell you about Teatro La Fenice on my blog because, in a city like Venice – so full with architectural and historical gems – only too often it is impossible to see everything there is to experience and savour. 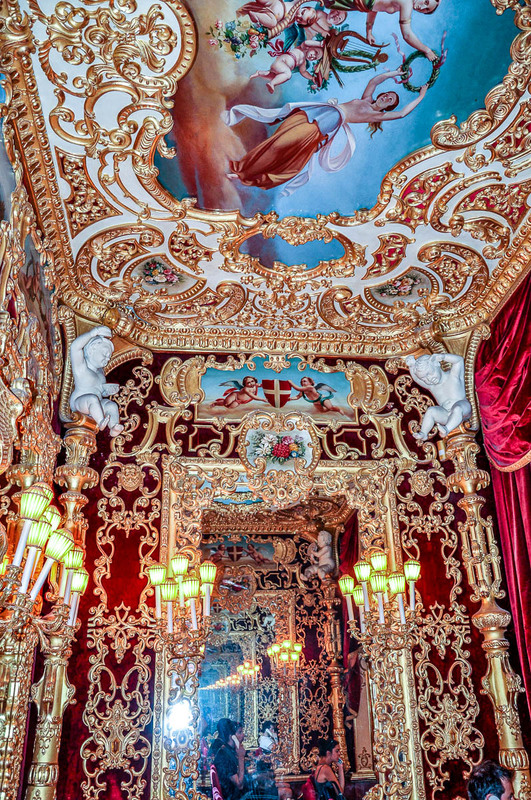 Seduced by the big boys on the tourist trail – the Doge’s Palace and St. Mark’s Basilica – people often realise they have no time left to walk the short distance from St. Mark’s Square and explore Venice’s fabled opera house – Teatro La Fenice. Others pass by its unassuming façade and, in the blindingly hot white light of the Venetian summer, they miss their chance to discover the rich history and architecture hidden right behind it. 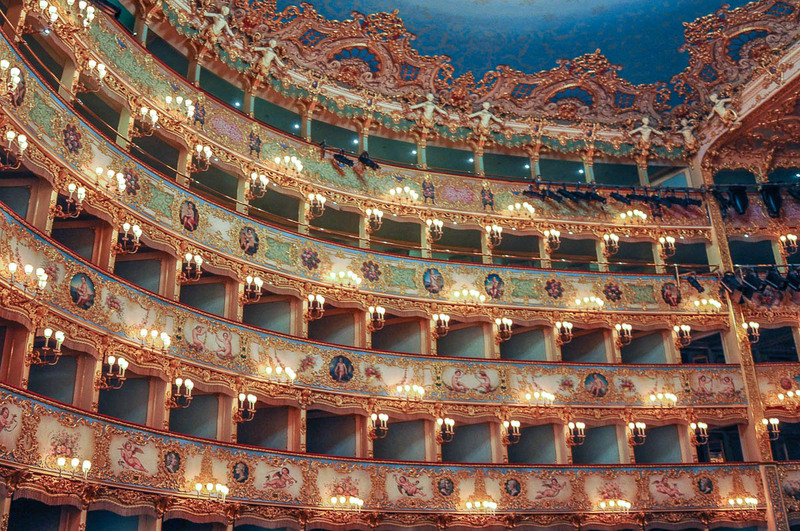 So, as I was to spend last Sunday in Venice, I made Teatro La Fenice the first stop on my travel wish list. I was eager to experience its atmosphere once more and to give you a taste for it. The sun was blazing over Venice, its powerful rays reflected a million times in the water of the myriad canals. I found it very hard to see ahead without my sunglasses, which I had forgotten at home in Vicenza. So, I was glad when the moment came to leave behind the fashionable ‘XXII Marzo’ street with its luxury boutiques and dense, irritable crowds. I stepped into a side alley. It was so narrow that, had I stretched my arms, I would have touched the walls of the houses on both of its sides. It was nice and cool there, the sun unable to get through the dense Venetian meshwork of tall houses built right next to one another. A bridge over a canal and a few steps down another narrow alley and I found myself on a small square, a veritable sun trap. 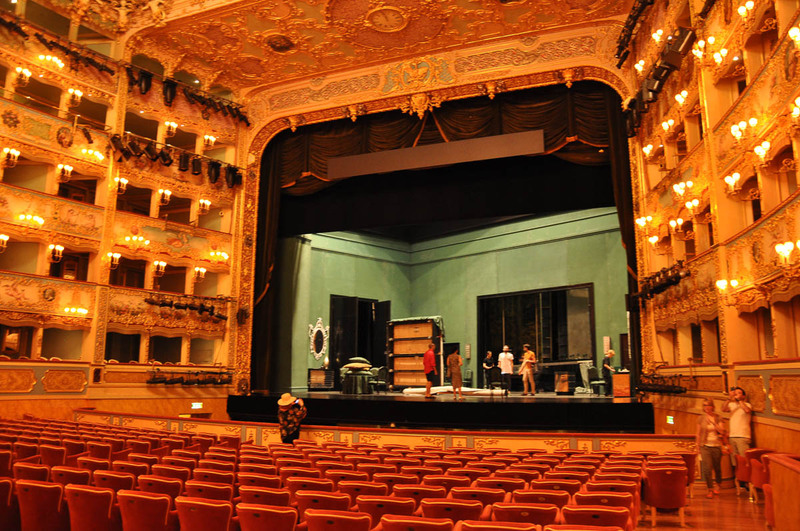 Right in front of me, Teatro La Fenice stood proudly. It was just the same as I remembered it from my first visit back in 2013. It seemed rather unbelievable that its mighty body had been ravaged by fire three times. Most recently by an arson attack in 1996. The opera house was then rebuilt from scratch between 2001 and 2003. I sought shade on its porch. 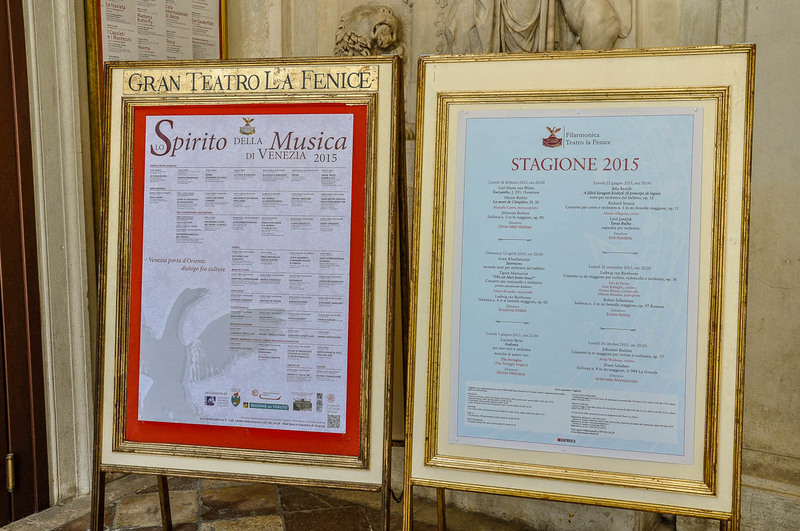 Big boards announcing the programme for Season 2015 were elegantly perched atop the steps. 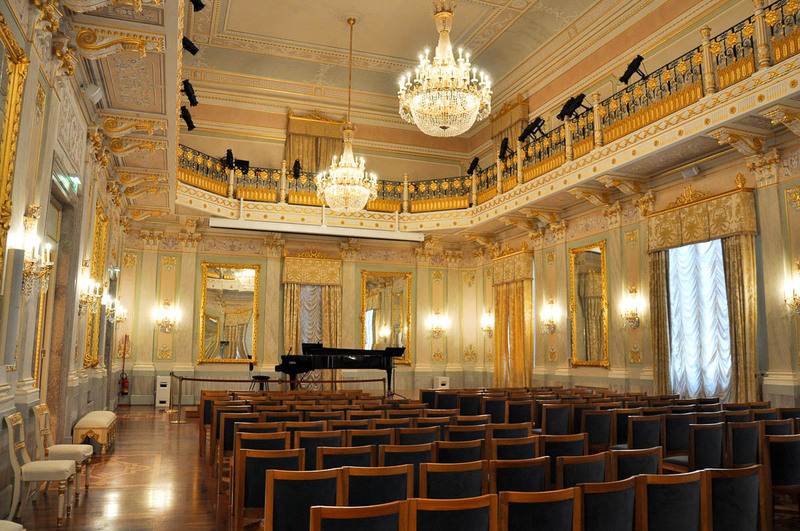 The music of Verdi, Rossini, Bellini and several other world-famous composers fill the house every night. Elegant ladies and gents flock to it, all dressed up to the nines. 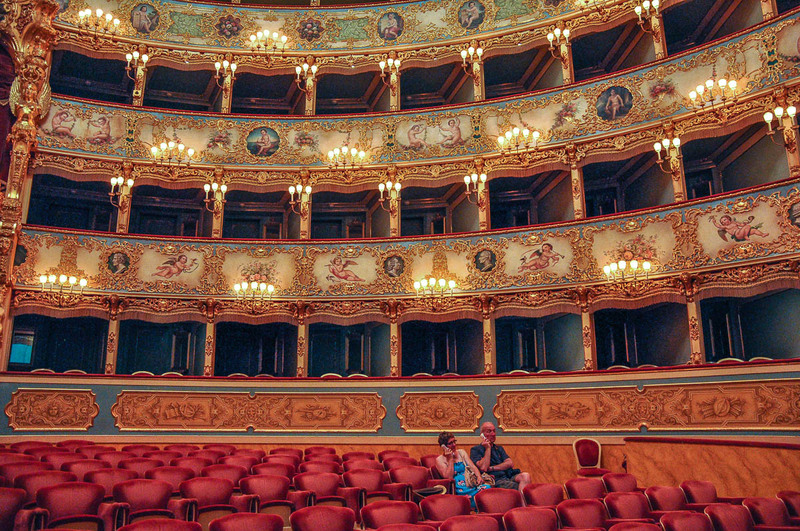 I remembered that back in 2013 when I was in Venice with my then fiance (now husband), we really wanted to see an opera at Teatro La Fenice. Unfortunately, at the time we couldn’t quite justify paying a couple of hundreds of euros for a ticket each. Instead, we visited the theatre during the day, when it is open for tourists against a much humbler fee. Now that we live in Vicenza which is less than an hour away by train, I guess we can buy some cheap tickets for a performance at pre-order rates. Then again, we need to think about getting a childminder for the night and organise several other details. 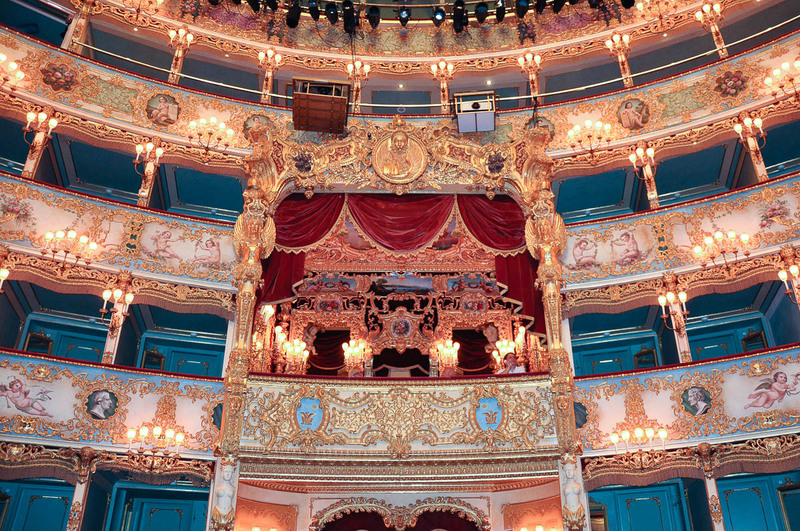 So, seeing an opera at Teatro La Fenice in Venice continues to be a bucket list item for me. Something I would love to do when the time is right. 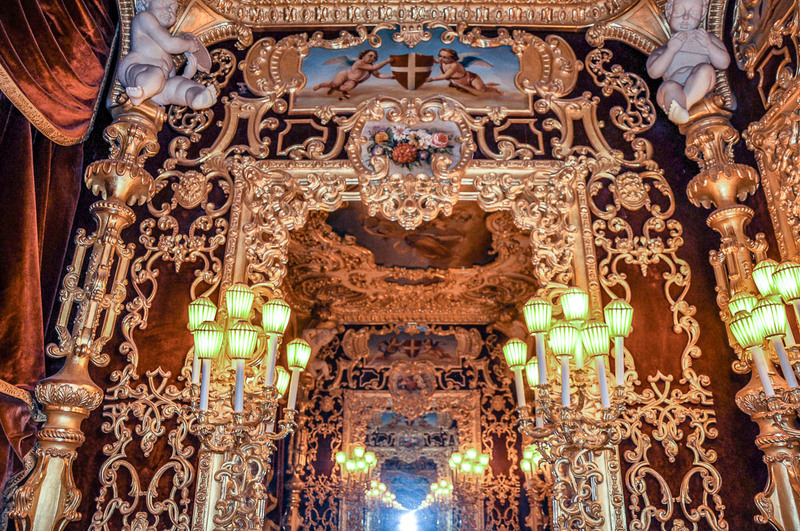 In the meantime, I was happy to visit Teatro La Fenice during the day as one of the many tourists who come to admire its lavish decor. I bought myself a ticket. It cost 9 euros and an audio guide was included in the price. As I wanted to take photos, I paid an additional fee of 3 euros in order to get a photography pass. I was given a little sticker to place on my top. It would signal to any curator observing the tourist flow, that I had the right to point my camera any way I liked. 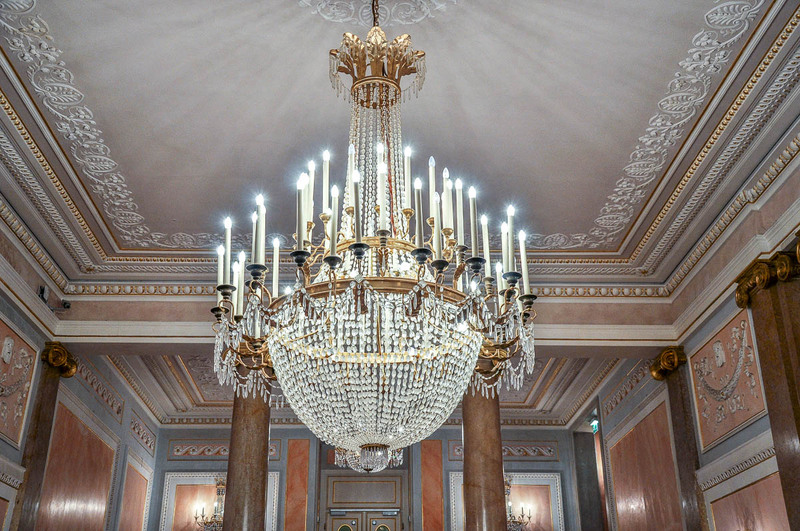 The first thing that may surprise you as you walk in Teatro La Fenice is the chandeliers dotted around the place. They are big and imposing, as you would expect them to be in a place like this. Most intriguingly though, they are made of crystal drops and beads rather than Murano glass (this is Venice, after all!). 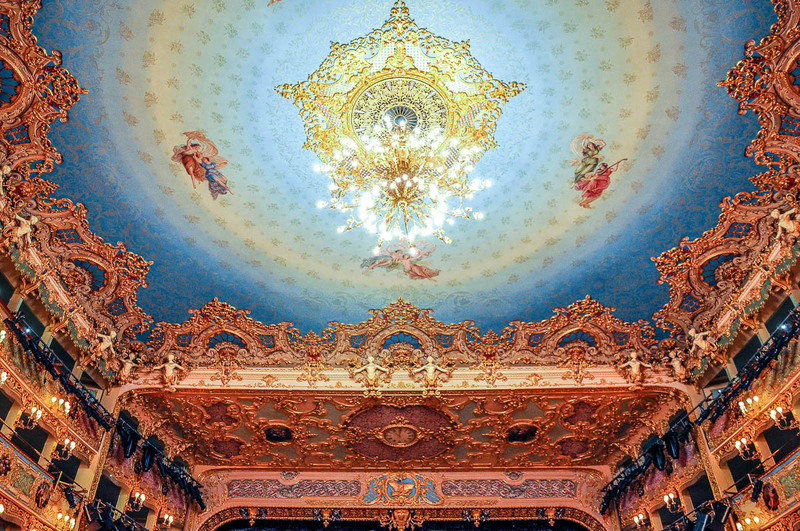 Still, the lavish chandeliers fit perfectly Teatro La Fenice’s decor. 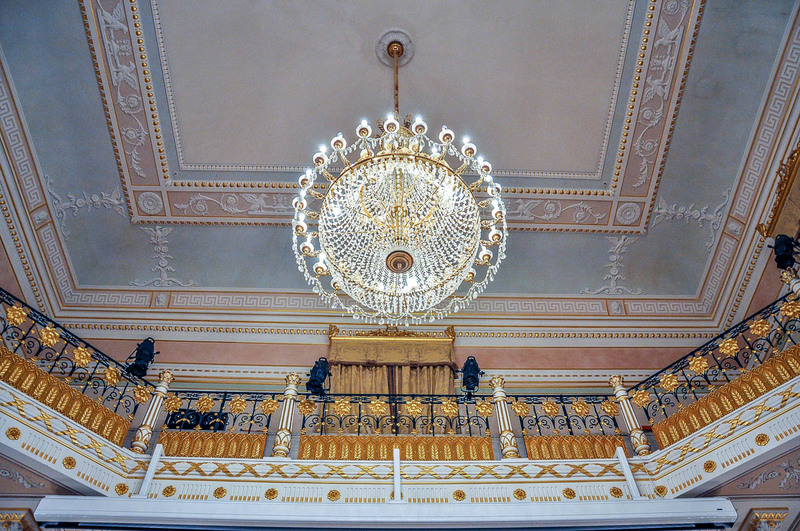 From the grand foyer to the gorgeous ballroom upstairs their flickering light emphasises the gilt ornamentation that is everywhere. 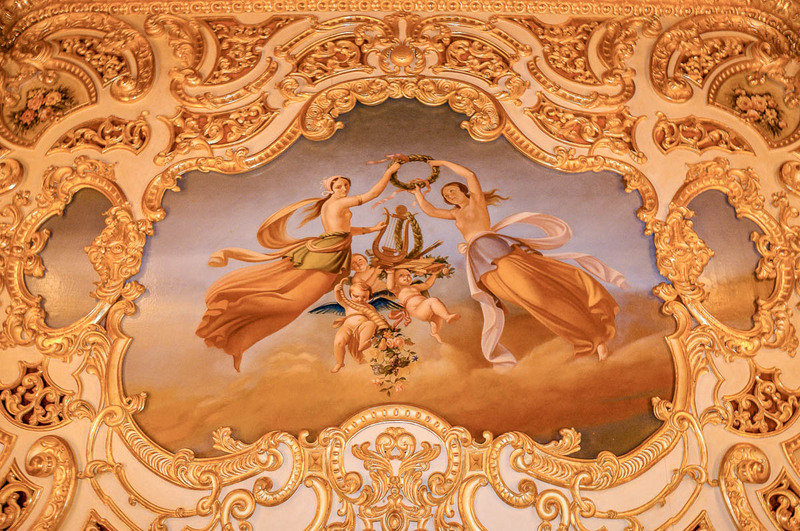 Yes, gilt is everywhere in Teatro La Fenice. 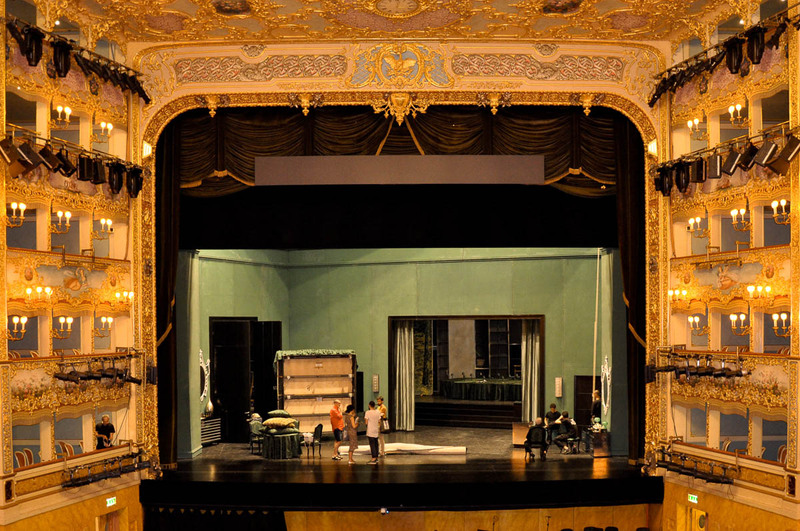 It covers the opera houses’ walls and boxes. It drips from the Imperial box. It fills your eyes with thousand reflections and distracts your camera, unsure what to focus on first. 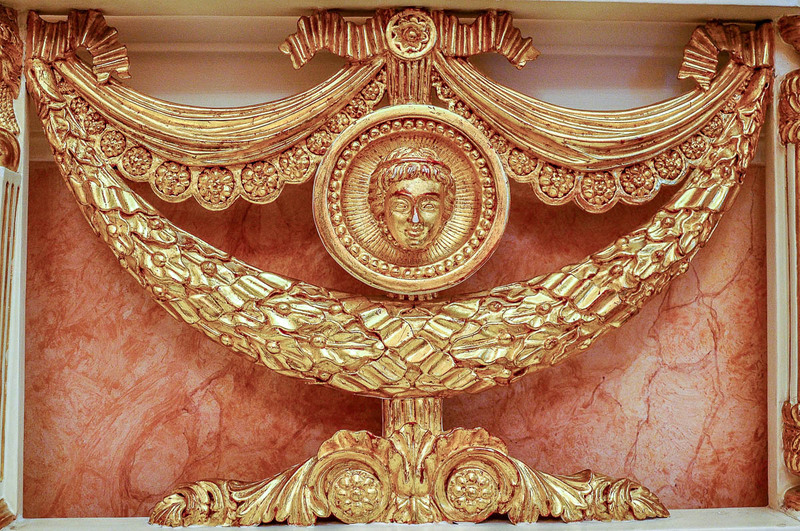 The richest concentration of gilt is in the theatre hall. Even though I had been there before and the memory of its opulence was still fresh in my mind, the sight of it took my breath away as soon as I walked over its threshold. On the big stage in front of me, the artists were in the midst of a work session getting ready for that night’s performance. Audioguides pressed against their ears, tourists were roaming around just trying to get to grips with the beauty of the place. And then, they would take their cameras out and would snap a shot after shot trying to take away with themselves the memory of it all. Right above the stage, a clock was counting the minutes. Plaster figures watched aloof from where the walls and ceiling met. 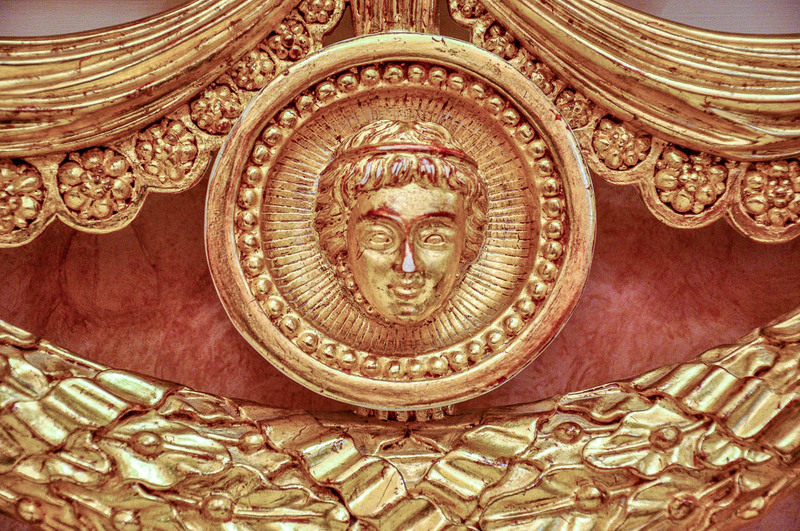 Frescoed cherubs adorned the boxes. And the gentle curve of the rows of boxes drew my eyes all the way to the top. Right opposite the stage stood the Imperial box. 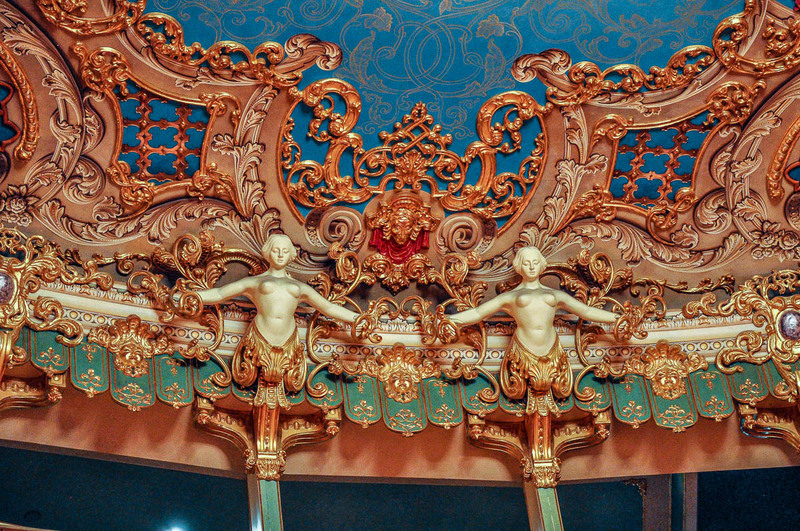 If the theatre hall reminded me of an enchanted forest, the Imperial box was like the magical grotto in it where mythical creatures would congregate. To reach the Imperial box I had to go outside of the theatre hall and up a flight of stairs. 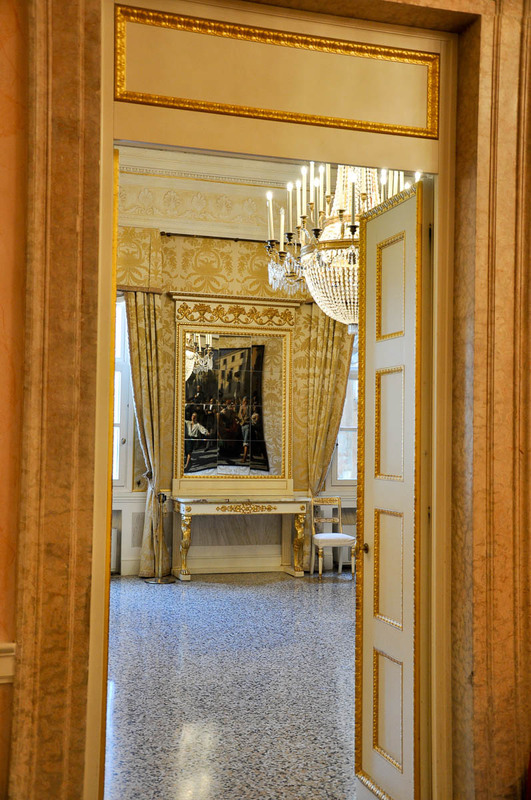 The simple, even austere appearance of the corridors with the doors leading to the many boxes gave my eyes a little break from the gilt extravagance of it all. 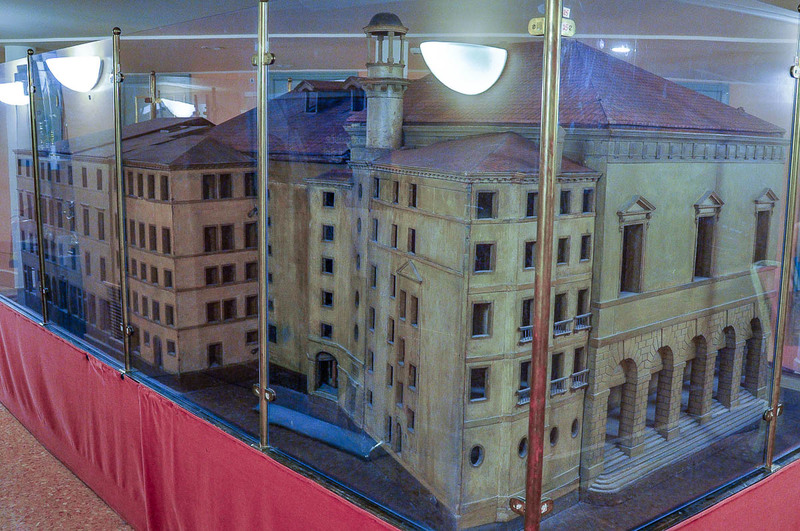 In the corridor, right outside of the Imperial box, there was a model of Teatro La Fenice. I was surprised to see how big the opera house actually was. It’s quite easy not to notice its sprawling body, compressed as it is between many other houses and buildings in Venice. 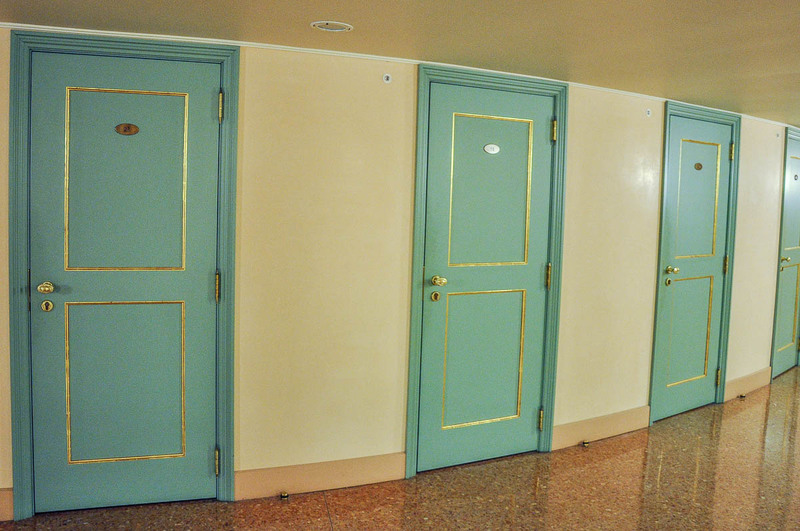 The walls of the Imperial box were covered with tall mirrors. This created an infinite effect of reflections and repetitions. 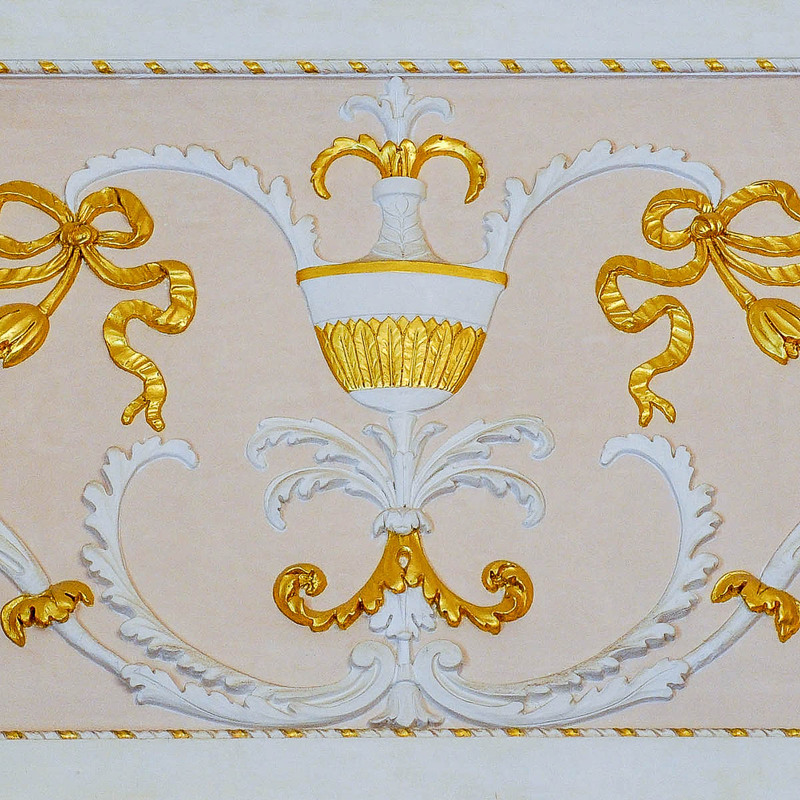 The lights, gilt, opulent ornamentation were reflected and repeated, it would seem, dozens of times until they disappeared into the mirrored distance. The effect was so overwhelming that I needed to sit down for a little bit to catch my breath. It was all so rich and intricate. 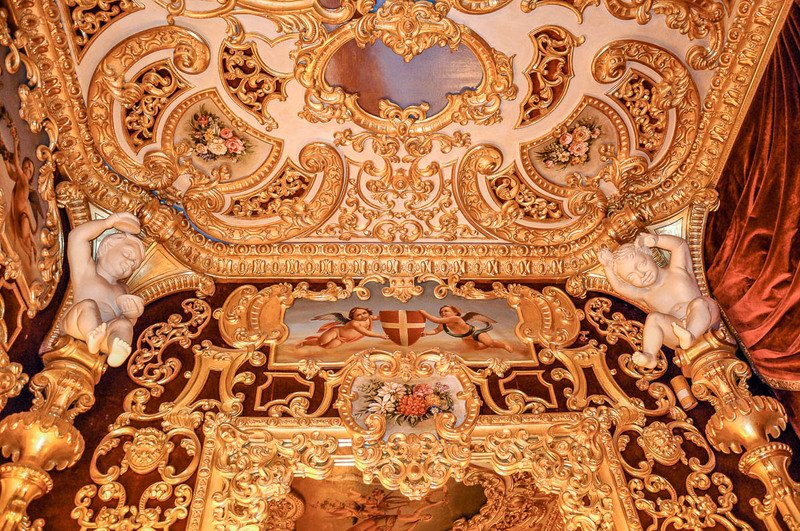 Intertwined motifs, plaster figures galore, frescoes on the ceiling. It was almost too much, but somehow it worked just fine without being gaudy, which was quite a fine line to tread, especially considering the lavishness of the Imperial box. At this point, I must have gotten a bit too carried away taking countless of photos, as the lady who was guarding the Imperial box, came to check if I had a photo pass. I showed her my little sticker and she was satisfied. Still, I saw people stealing glances around and then furtively snapping a photo or two without her saying anything. 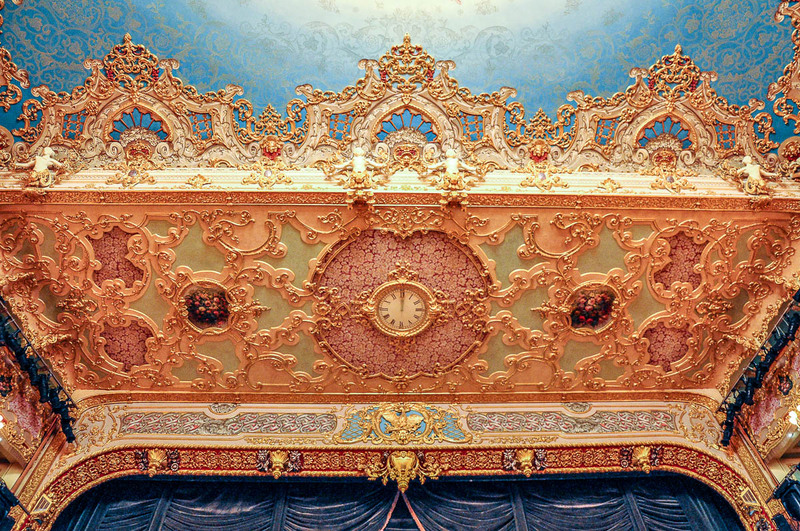 Here is the last photo I took in the Imperial box – its ceiling fresco. 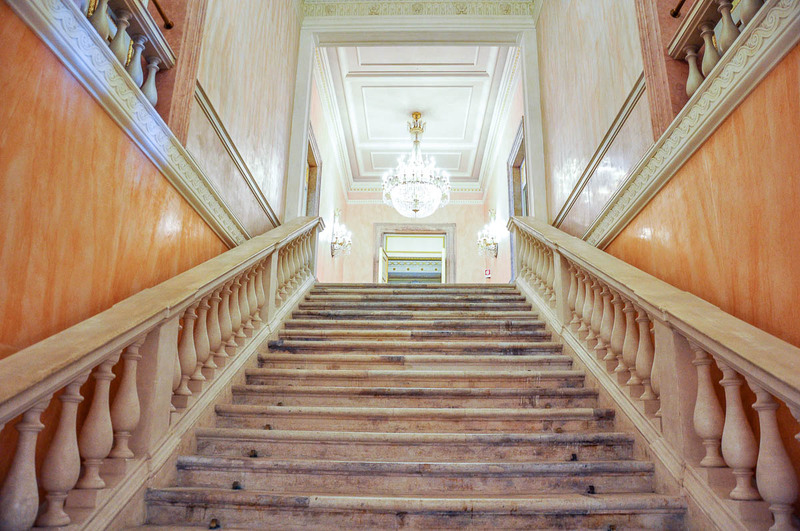 It was time to explore the top floor of Teatro La Fenice – the place where cocktails are held after the performance has finished. This is where the opera house’s ballroom is, too. 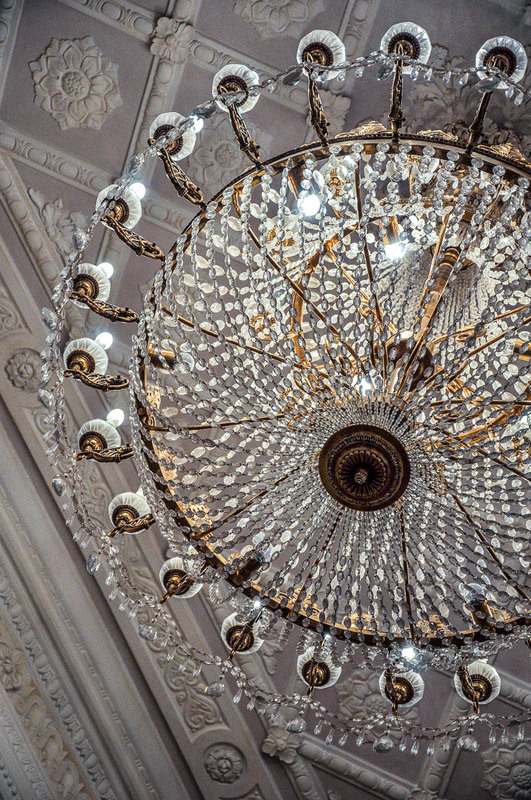 I went up the stairs crowned by yet another splendid crystal chandelier. With its plain apricot walls, the place was much more subdued than the theatre hall. Yet gilt had found its place there too, albeit on a much smaller scale. …and benches came with the most intricate backrests. The ballroom was lovely and airy with a grand piano on a low stage. A balcony was running alongside the room right underneath the ceiling. 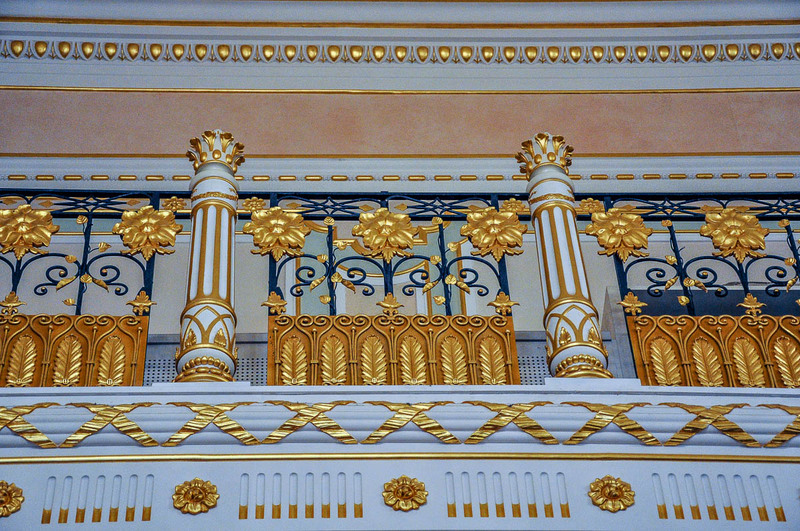 Its railings were of exquisite ironwork emphasised with gilt detailing. 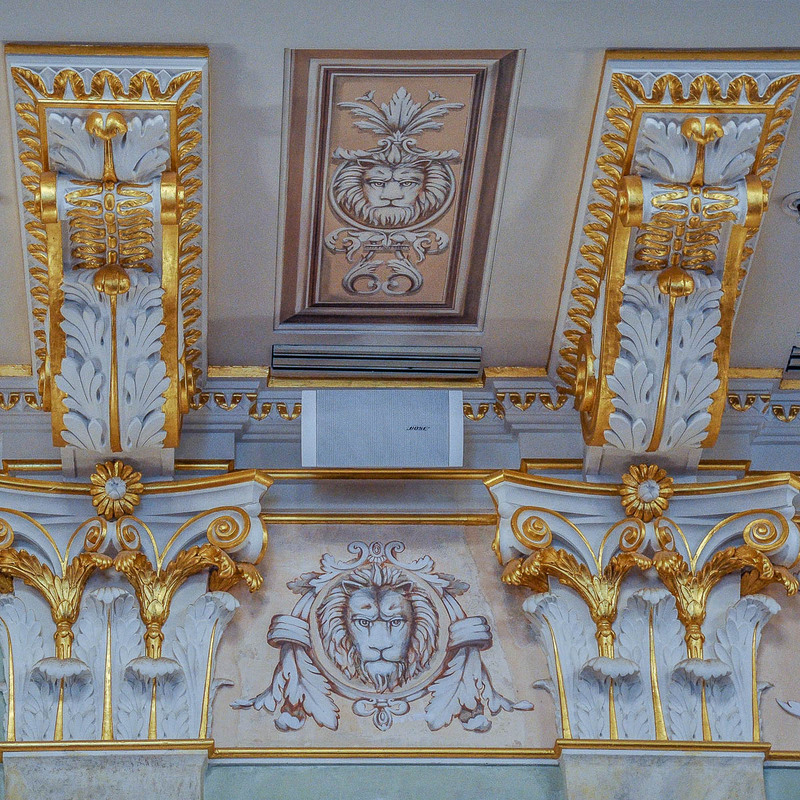 Mighty pillars supported the ballroom’s walls, all adorned with a lion’s head – the symbol of Venice. 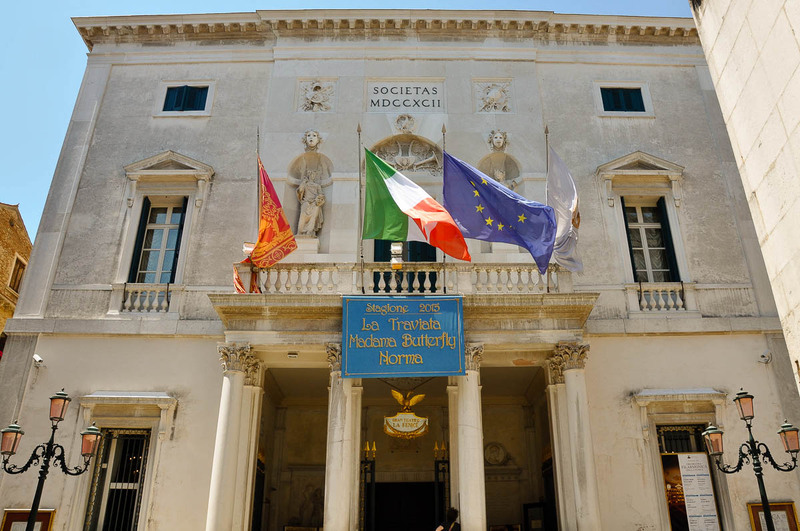 I remembered that when I had been there in 2013 there had been an exhibition celebrating the most famous singers who had sung on the stage of Teatro La Fenice. I was very happy at the time to spot one of the most illustrious Bulgarian opera singers prominently featured. I went to look for the exhibition half-hoping that it would still be up and I could show you a picture of my compatriot. Unfortunately, the room was empty, the exhibition had been temporary and it was long gone. I had one last look around, glanced admiringly at the exuberance of it all and slowly walked out into the hot Venetian sun. 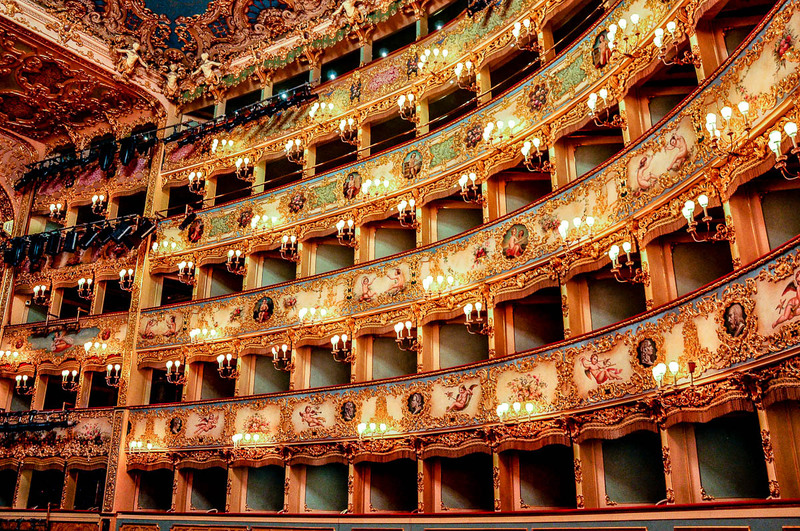 When you are in Venice, make sure that you have Teatro La Fenice on your list of things to see. It is a fabulous mix of architecture, history and music under a blue ceiling reminiscent of a mythical sky. 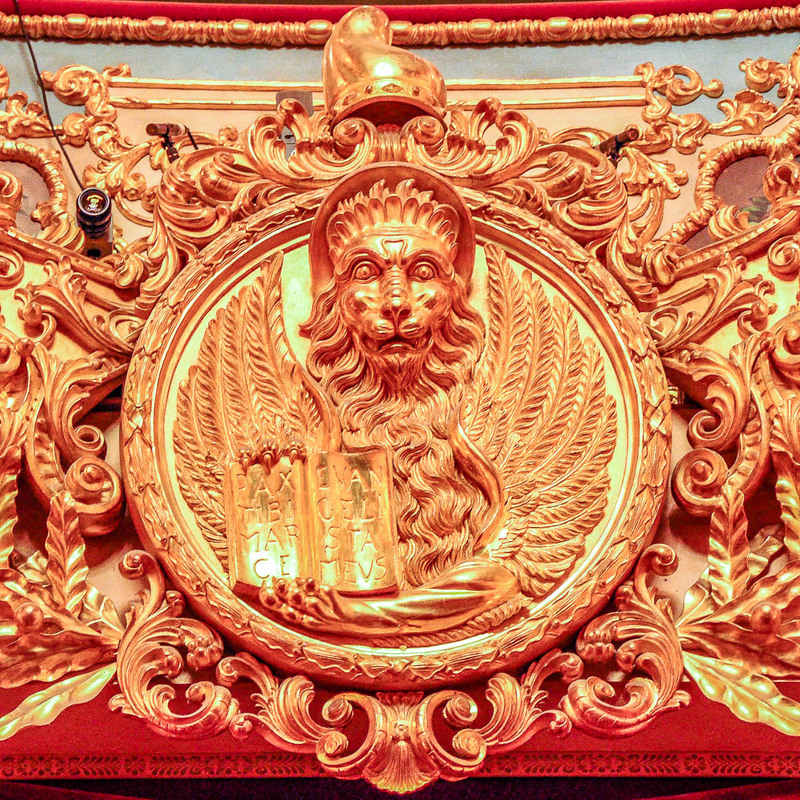 You can find the detailed history of the theatre at this link. It makes for a riveting reading about passion, music, fire and rebirth. And I promise to let you know in text and pictures as and when I manage to see a performance at this fabulous place. 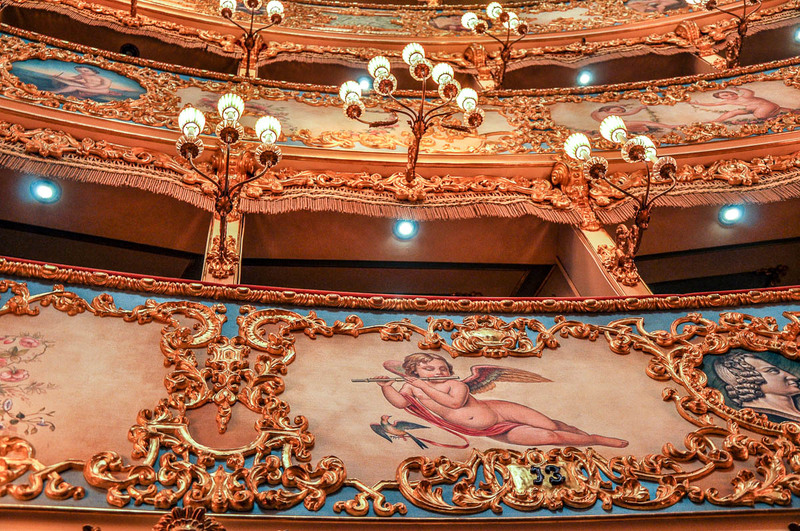 You will find Teatro La Fenice at Campo San Fantin 1965, Venice 30124, Italy. Click here to visit the website of the opera house. Or here to check current ticket prices and opening times. Enjoy!